For the past few years I haven’t ridden much. The reasons are mostly in my head, but regardless of exactly why, it’s all on me to get past the obstacles and make it happen. 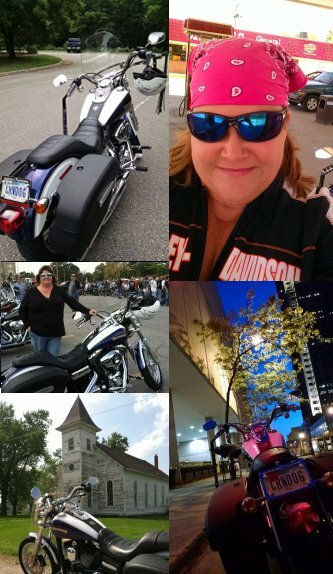 So this year I was determined that I was going to get back into the habit of riding, every time I could. I’m fortunate to be able to report that I rode every weekend in July. Three of these rides were lunch rides – not a lot of miles on any one of them, but really fun days nonetheless. More on those in a moment. 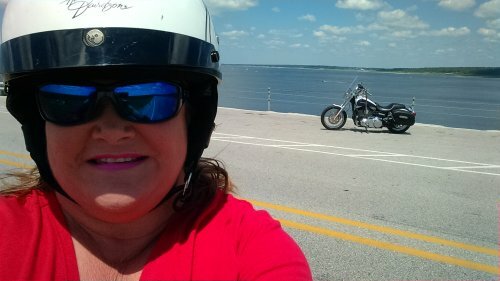 One of course was a Chrome Divas ride, and one was with Greg, who doesn’t own a bike but borrowed one so he could share a day with me. Those ride reports are coming up soon. 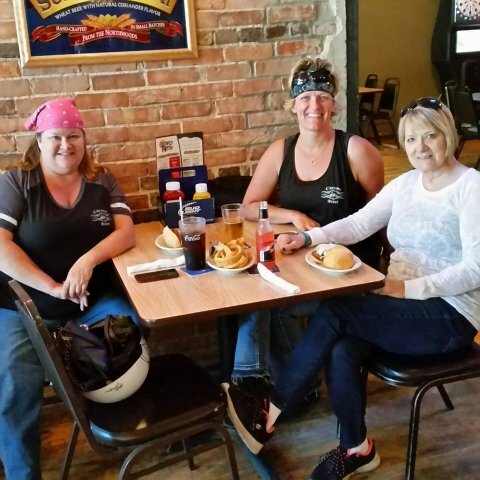 But first – lunch rides! 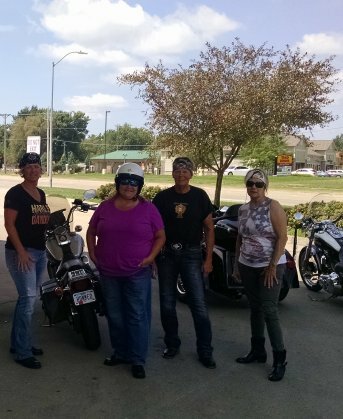 This ride was Penney, Carrie and myself… we got a later-than-planned start (ahem – Penney…) but we rode from my house in West Des Moines, north and west through town up to Highway 44 in Grimes, then west on 44 into Panora. 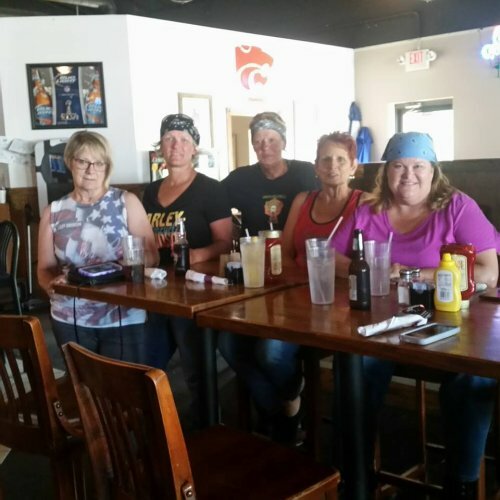 Lunch was at The Owl’s Nest on Main Street, and the ride home was along some beautiful county roads through Redfield, Adel, and Van Meter. From Panora to Adel, the P28/F59/F60 route is and has always been one of my favorites – beautifully curved roads, great rural scenery, and little in the way of traffic. But this time instead of just staying on Highway 6 from Adel into Waukee and then home, we dipped down on R16 which took us into Van Meter where we then picked up F90 into West Des Moines. I had never been on R16 before, and it is also a very pretty road with a hill/bluff on one side and lush bottomland on the other, very close to the Raccoon River. After shopping we traveled back to the north along Highway 69 through Indianola and then northeast into Carlisle, where “Diva Emeritus” Shirley (she’s our founding Treasurer!) joined us for lunch at Cal’s. The route back into Des Moines was along the Highway 5 bypass. 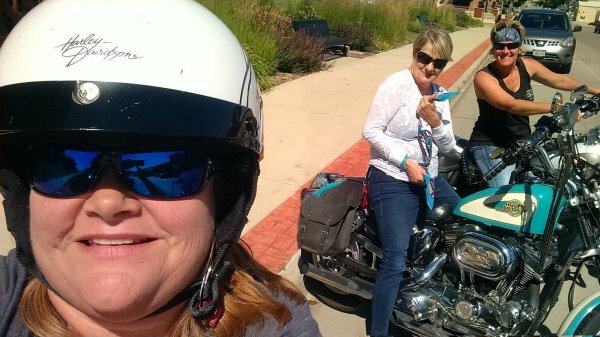 The last Saturday of the month was looking like it might just be Sharon and I for a lunch ride, but then Sharon ended up not feeling well. So Friday night I thought maybe I wouldn’t ride at all, but when I got up Saturday it was absolutely beautiful out so I said to heck with it, solo ride! (Waffle much? Not me…) I decided to make a return trip to BFE Vintage Motorcycles in Luther, Iowa (just north of Madrid), having noticed on Facebook that they have moved into a much bigger building adjacent to their old one, and expanded their old building so it is now a barbecue restaurant. (Also more in a future post!) 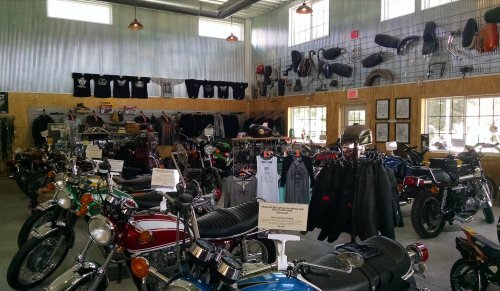 Stopped in to see the new shop and awesome vintage bikes – I seem to have a crush on these late 60’s Hondas, Allstates, and others with the indented tank style – then decided to try out the BBQ, which was very good! 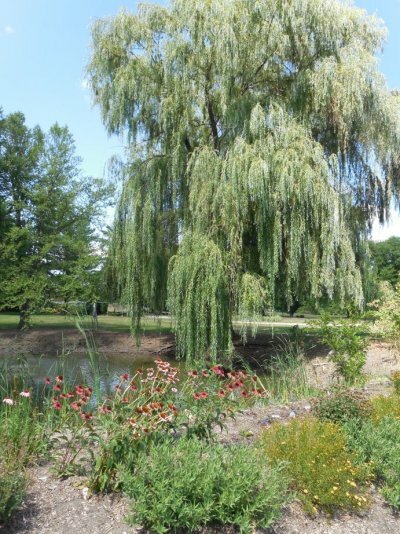 I then traveled a couple miles farther to the west and visited the Iowa Arboretum, one of my favorite places in Iowa with over 300 acres of specimen trees, perennials, walking trails, and landscape features. 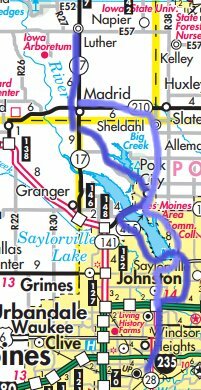 My route home was back down to Madrid and then through Sheldahl, Polk City, and the Saylorville Lake area. A word about scenery on these rides: ditches! I think our hot/dry weather has had an impact on the wildflower situation here – they are lasting much longer than they normally do, with roadsides filled with blooming waves of orange ditch lily, blue chicory in the hard scrabble along the shoulders, white Queen Anne’s Lace in the grassy areas, and this low-growing stuff with yellow flowers that I haven’t identified. And, on the way back from the Arboretum, there was a large beautiful ditch filled with spikey purple liatris. When it’s all in bloom at once it is absolutely gorgeous – and of course in the lowest-lying areas, the reedy cattails are a deep soft brown. 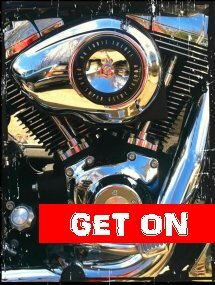 More soon on my other July rides, as well as BFE Vintage Motorcycles! Thank you for taking us along on your rides. Sure wish I could have been with you! Keep the shiny side up & smile on your beautiful face! Aw, thank you Seven Over! Life is good, and I am rarely without a cheesy grin! I appreciate your friendship so much! I’m glad to see you out riding!! I wish I was there to go riding with you. :) Maybe next summer. Smooches back at ya, looks like Alaska has been amazing! Wow! Looks like you guys love riding so much like Me and my hubby John! Love it! Looks like a great ride. We’re finally getting close to Springtime….!! I really like the white helmet which you are wearing. 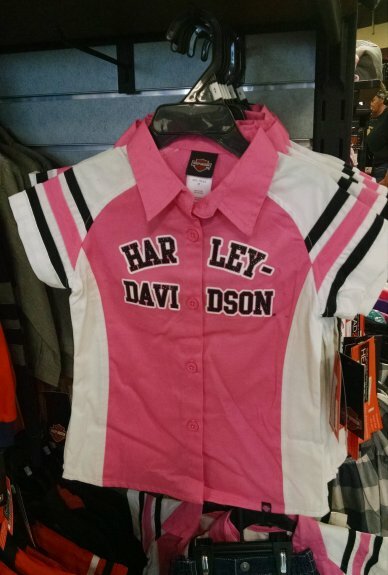 Can you provide me with the name, I want to buy it for my sister. It seems that you guys, love riding. Simply say, Wao!